The Holy Father’s friendships and strong tradition of dialogue with Jewish leaders are already having an impact, building on the foundation provided by previous popes. NEW YORK — The bonds between Jews and Catholics have never been stronger in the Church’s 2,000-year history, but some Jewish leaders say that, with Pope Francis, the best is about to get even better. Blessed Pope John XXIII reset Catholic-Jewish relations in the 1960s, seeking to reconcile the grievances of the past, in which Catholics had treated Jews less like beloved brothers and more like strangers — or worse, as enemies. The Church approved that outreach in 1965 at the Second Vatican Council with the document Nostra Aetate, and Popes Paul VI, Blessed John Paul II and Benedict XVI all continued efforts to deepen those relations. But Pope Francis’ pontificate represents a new chapter of deeper understanding and friendship between Jews and Catholics. Few things highlight Pope Francis’ relationship with the Jews more than his deep, abiding friendship with Rabbi Abraham Skorka, rector of the Latin American Rabbinical Seminary in Buenos Aires. The two men started a friendship in the late 1990s with a joke over their favorite soccer teams, and they published a book in 2010 called On Heaven and Earth, revealing their interreligious dialogue on 29 different topics. The Pope and Rabbi Skorka made history by sharing meals and praying together during Sukkot and Sabbath at the Vatican — making Pope Francis perhaps the first bishop of Rome to do so, since St. Peter himself. Rabbi Skorka has been in the United States sharing his experiences with Pope Francis at the Jewish Theological Seminary in New York on Oct. 29 and at Sacred Heart University in Connecticut, where he received an honorary degree. The book co-written by Pope Francis and Rabbi Skorka reveals how they feel dialogue should be conducted: by becoming acquainted with the person, viewing him as having something good to say, but not compromising one’s different identity while finding common ground together. Rabbi Skorka said he and Pope Francis have discussed that the next step in their dialogue “will be a theological one”: what a Catholic means to a Jew and what a Jew means to a Catholic. Rosensaft said that Pope Francis’ personal touch leaves the deepest impression. The Pope had surprised Rosensaft with a personal email, later published in The Washington Post, thanking Rosensaft for mailing him a copy of a guest sermon he had written for his synagogue about where an all-knowing and all-powerful God was present in the Holocaust. “It’s how he relates to other people with respect, love and concern,” he said. “The bigger picture is his whole thinking that we need a culture of encounter (which is more broad than just the Jewish community) with everybody — no matter what they believe in,” Father Crossin added. 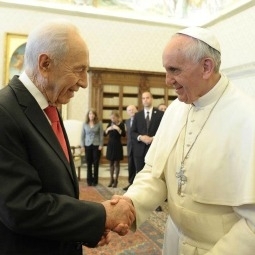 Rosensaft said Pope Francis not only displayed this personal concern to the World Jewish Congress’ president, Ron Lauder, but has shown that actions follow his words. He said Lauder had met with Pope Francis in September to share Jewish concerns that the Polish government was going to curtail their religious liberty by banning the kosher slaughter of animals. Rosensaft said Pope Francis thanked Lauder for bringing this to his attention and said he would see what he could do. Within a month, the Polish bishops were speaking out against the legislation, and Poland’s government has pledged to reverse the law. “I’m quite convinced there is a direct link between the two,” Rosensaft said. Pope Francis also proclaimed “a Christian cannot be anti-Semitic,” emphasizing how much Jews and Catholics have a “common root” and share much as a consequence. Rosensaft saw Pope Francis’ commitment to these words also fulfilled in the Vatican’s refusal last month to give Nazi war criminal and Holocaust-denier Erich Priebke a public Church funeral. Priebke — who spent nearly 50 years in the Holy Father’s native Argentina after escaping in 1946 from a British prison camp — had never publicly repented of his role in the murder of Jews and Italian civilians, following his extradition to Italy in 1996 and his subsequent conviction and sentence of life imprisonment for his war crimes. The breakaway Society of St. Pius X subsequently offered to give Priebke the requiem Mass his lawyer wanted — the day before the 70th anniversary of the Nazi roundup of 1,000 Roman Jews sent to die in Auschwitz — but an outraged mob blocked the casket from ever entering the SSPX chapel in the Albano Laziale suburb, and local authorities canceled the funeral. Gary Krupp, a Jewish leader who runs the Pave the Way Foundation, said Pope Francis’ treatment of the unrepentant Priebke was consistent with the actions taken by Pius XII against unrepentant Nazis. “No priest was allowed to officiate at their funerals,” he said. Krupp said he believed Pope Francis will also be the pope to draw Jews and Catholics even closer together by vindicating the legacy of Pope Pius XII. The subject of Pius XII is sensitive for many Jews. Rabbi Skorka told the Register that both his mother’s and father’s families lost many family members during the Holocaust, and he himself questions why Pius XII did not publically denounce Hitler’s extermination of the Jews. However, he said that revealing the Vatican Secret Archives will be key. Krupp said opening the Secret Archives will be decisive and that Pope Francis — whom he described as “very pro-Pius XII” — is eager to see them opened at last. Krupp said the cataloging of the Secret Archives is in the final stages. Pope Francis intends to visit the Holy Land next spring, and with him will be his longtime friend Rabbi Skorka. The two leaders plan to embrace each other in Jerusalem at the Wailing Wall and will go together to Bethlehem, in the Palestinian territories, to visit Jesus’ birthplace. But the gesture could also send a very powerful message for dialogue and peace for not only Israel and Palestine, but for the whole Middle East, which has been the epicenter of so much violence and conflict. “That will have a very positive effect on the region,” said Betty Ehrenberg, executive director of the World Jewish Congress, North America. Ehrenberg said she is looking forward to the deepening of cooperation between Catholics and Jews that Pope Francis has been encouraging by word and example. She said the recent summit between Jewish and Catholic leaders in Madrid, and the joint declaration they signed, reflected that. During his daily Mass Pope Francis centered his homily on the Sacrament of Reconciliation, stressing that sin is an everyday struggle which requires accountability through “face-to-face” contact. “Confessing our sins is not going to a psychiatrist, or to a torture chamber: it’s saying to the Lord, ‘Lord, I am a sinner,’ but saying it through the brother, because this says it concretely. ‘I am sinner because of this, that and the other thing.’”Pope Francis opened his homily by reflecting that for many believing adults, the idea of confessing one’s sins to a priest is either so unbearable that they completely avoid the Sacrament, or the process is so painful that the truth is transformed into a form of fiction. Recalling St. Paul’s words in his letter to the Roman’s from the day’s readings, the Pope noted that the apostle did the opposite, confessing publicly that “good does not dwell in me, that is, in my flesh,” and that he doesn’t do the good that he wants, but only the evil which he hates. Pope Francis then emphasized that the most important element for Saint Paul in finding a way out of this justification was to confess his sin to the community, noting that “he doesn’t hide it,” and that the confession of one’s sins with humility is something which the Church requires of us all. “Confess your sins to one another,” he said, repeating the words of Saint James, not to be noticed by others, but rather “to give glory to God” and to recognize that it is only him who can save. Concreteness, honesty, and the genuine ability to be ashamed one’s mistakes are all qualities needed in order to be open to the forgiveness of God, as well as the deep awareness of his love, the Pope noted. • Ash Wednesday – marks the beginning of our annual pilgrimage through the Lenten desert to that glorious promised land of Easter. • Ash Wednesday is the day each year in which we renew our pursuit of holiness with greater intensity using the simple tools of prayer, fasting, and almsgiving. • Ash Wednesday is also the day of the year when we take a good, long, hard look at ourselves, reflecting on our personal sinfulness and failures in the moral life and making the decision to sin no more. • And the ashes that we wear today are the outward sign of our repentance – of our desire to be reconciled. They are the sign of our desire to turn away from sin so that we might be faithful to the Gospel. • The ashes that we wear today symbolize our recognition that we are sinners, and that without God’s grace and mercy, we are nothing more than dust, and unto dust we shall return. • The ashes we wear on our foreheads today are a sign of our desire and our intention to unite ourselves to our Lord’s passion and death during Lent so that we may be united to His resurrection at Easter. • But I encourage you to wear your ashes today as a sign of something else as well. • There is a great sickness in our society, a sickness that has afflicted our western society for many centuries. And that sickness is selfishness. We have become a very self-centered and self-absorbed society, and this sickness is leading us to spiritual death. • We are constantly bombarded in our world today with the message that we need to take care of ourselves first. We are encouraged constantly to indulge ourselves, to spoil ourselves, and that we deserve whatever luxury we can afford. • We are even told that we can determine for ourselves what is right and wrong, taking our self-centeredness to new heights of depravity. And in doing all of this, we make ourselves to be gods, for self-indulgence, my friends, is just a way of worshipping ourselves. • Yet as Catholics we know that selfishness is the heart of all sin. Like Christ whom we worship and adore, we know that we are called not to be self-centered, but other-centered, placing the needs and desires of others before our own. • We are called, of course, to share our goods with others and to sacrifice for the good of others. But we also called to think about the feelings of others before we speak, to defend others when they are in danger, and to encourage others in the pursuit of holiness. • And honestly, my friends, if everyone in the world were focused on the needs of others, no one would ever be lacking in anything. • Thus, I encourage you today to wear these ashes not only as a sign of turning away from sin, but also as a sign of turning away from self. • And in turning away from self so that we might serve others, let us hope that our Father in Heaven who sees what goodness is hidden in our hearts will repay us. May our Father in Heaven have mercy on us all this Lenten season. • Do you love Christ? Is Jesus your friend? Is our Lord the highest priority in your life? Are you willing to forsake everything for the sake of your relationship with Him? • Are you willing to give up your possessions, your money, your reputation, your friends and family, your very life for the sake of Christ and His Church? • St. Paul makes the very basic point that Christ Himself is our prize! And while he hasn’t yet attained the eternal possession of Christ in heaven, he continues his pursuit of this in the hope that he may one day possess Jesus eternally. • And as Christians we must do the same! Why? Because Christ first loved us. • Moreover, Jesus is the only path to heaven. If we hope one day to enjoy the eternal bliss of heaven, we must know Christ, love Christ, and serve Christ. • We are now getting close to Holy Week and the end of Lent. Lent is the particular time of the year that Holy Mother Church calls us to renew our relationship with Christ and to be reconciled to Him. • For Lent is not simply our time to prepare for Easter; it’s also our preparation for eternity. • Perhaps sometimes we approach the thought of conversion and reconciliation with God with some amount of dread and fear, for being converted and reconciled to God requires that we face up to our sins, because it is our sins that destroy our relationship with the Lord. • Perhaps we fear facing up to our sins because we fear God’s wrath and judgment. Maybe we fear that God is waiting to punish us. • Yet, in truth, God has created us to live in relationship with Him, to be in friendship with Him. And God has really gone out of His way to make this friendship with Him possible. • Ever since the fall in the Garden of Eden, there has been a barrier between God and man. But God has overcome our sinfulness. • We see God’s work of overcoming man’s sinfulness writ large in the stories of the Old Testament that speak of our salvation history. • The stories of Abraham, Noah and the flood, Moses and the Israelites being delivered from Egypt through the waters of the Red Sea and their 40 years in the desert all show the great lengths to which God is willing to go to save mankind and reconcile us to Himself. • The prophet Isaiah alludes to these mighty works in our first reading when he reminds us of how the Lord opened the way in the sea and a path in the mighty waters, and of how He has put water in the desert and rivers in the wasteland. • These waters of grace through which the Israelites passed in the Red Sea and of which they drank in the desert are still given to us today through the Sacrament of Baptism. • Just as the Israelites were freed from the slavery of Egypt by passing through the waters of the Red Sea, so too are we freed from the slavery of sin as we pass through the waters of baptism. • Today’s first reading is a prophecy by Isaiah that foretells how the Israelites will be restored to their land and the miraculous natural events that will occur along with their restoration. • But this passage was not meant to be understood just in literal terms. It was also meant to be understood spiritually, and spiritual writers see in this reading an analogy for how God desires to work in our souls. In short, He is a God who restores us. • Even though our souls may be a desert wasteland because of our sins, the Lord can make a river of grace gush forth within us. Just as God restored the Israelites to Judea, He can restore our souls to their natural beauty. And this He does through the sacraments. • If we open up our souls to God with heartfelt contrition and sorrow for our sins, He will flood us with His healing and His peace. • This is all possible because of God’s mercy! Last week I mentioned the point made by St. Thomas Aquinas that God’s all-powerful nature is most perfectly expressed in His mercy. • We see a great example of this in today’s Gospel. Like last week’s story of the Prodigal Son, today’s Gospel really shows us what God is like. This week’s story gives us some real insight into how our Lord deals with sinners. • Think for a moment how Christ treats this sinful woman. Unlike the scribes and Pharisees who want to stone her, Christ doesn’t condemn her. Instead, He forgives her and tells her to go and sin no more. Jesus doesn’t excuse her sin; He simply encourages her to stop doing it. • My friends, this is the God we worship. He is a God who doesn’t condemn us, but who is always ready to forgive us when we’re truly sorry and ask for forgiveness. And that should give us all great confidence as we approach the confessional. • Our Lord is not harsh and judgmental, but gentle and loving. He seeks to heal us, to forgive us, and to be one with us. And He encourages to live good and holy lives, putting our sinfulness behind us. • Note, however, Jesus’ last words to the woman: “Go, and from now on do not sin anymore.” He tells her quite clearly to desist from her sins. While He is compassionate to her, He does not turn away from correcting her. • Brothers and sisters: our Lord is constantly looking for opportunities to reconcile with us. He desires above all else to give us His mercy. Our Lord loves us with a depth and an intensity that we cannot fathom. • The truth of His love is a reality that we are reminded of every time we look at a crucifix. • Therefore, my brothers and sisters, let us be willing to forsake all else for the love of Christ, which is beyond all understanding. Let us place all of our hope in the mercy of our Lord, by which we will be saved.